Here's how I used them. Begin with a piece of acetate, this one has a protective film on both sides. Trim corners and punch hole in top center. 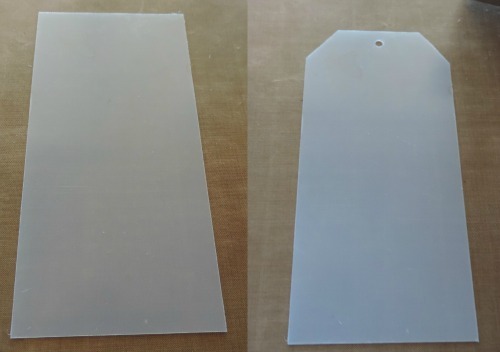 Any clear acetate or packaging can be used. Emboss with embossing folder, two passes were needed here since the tag is longer than the embossing folder. Peel protective coating from back. The conventional way to use Alcohol Inks is to drop them on felt that is on a blending tool. However, I wanted a thicker coating on this so did it a little differently. Drop several drops of Eggplant Alcohol Ink, enough to cover tag back. Smear around and then pounce, let dry. 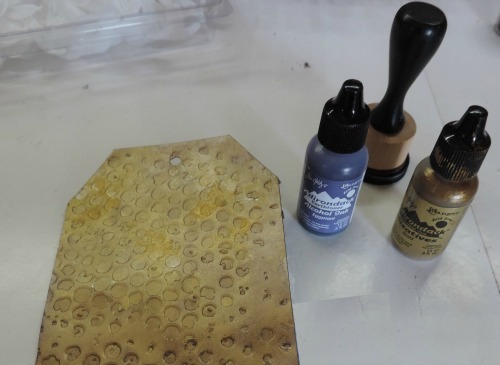 Drop on several drops of Gold Mixative, smear around and then pounce, let dry. Be sure to cover the entire back of tag. 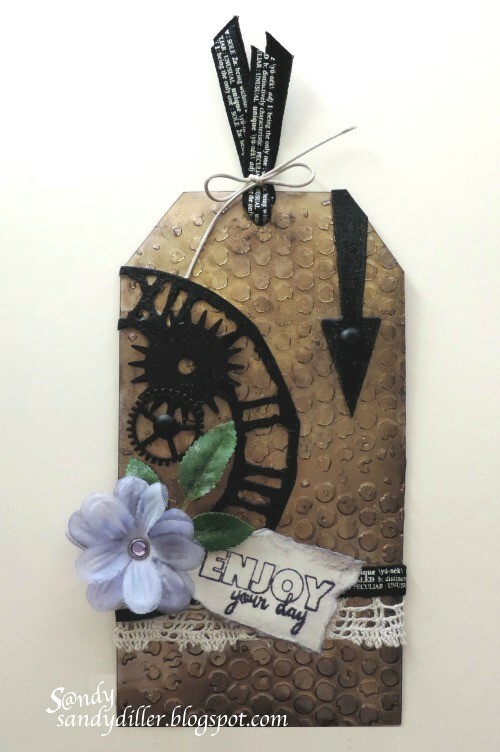 Using the Weathered Clock Die, cut 1/2 clock from Grunge Board. Cover entire front of clock with Versamark Ink - add black embossing powder, heat until embossing powder is melted. The arrow is a Grunge Board piece from my stash that was treated exactly the same way. On front of tag, edge with Archival Black Ink - add lace and ribbon. Items used here are both Graphic 45 Staples. Clamp in place until glue is dry. Because this is acetate I used Glossy Accents as my glue. Silk flowers were used here, white flowers colored with Dusty Concord Distress Ink. Stack three flower parts - hold together with a brad in the center. Add clock and arrow to tag. Punch hole in tag and place flower with brad through hole. Add leaves. I used two chipboard gears from my stash and colored them the same as the clock and arrow. 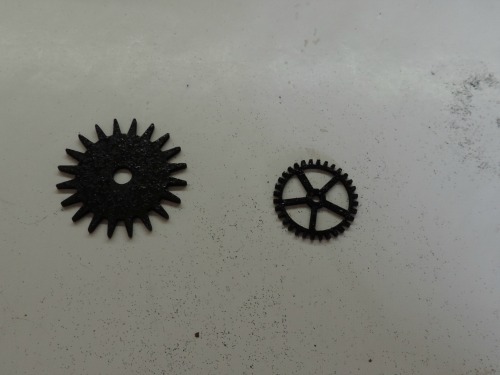 One black brad was added to the small gear as well as to the center of the arrow. Stamp sentiment on manila paper, this stamp is from the new Karen Burniston collection, using Dusty Concord. Tear edges and ink with Dusty Concord, add to tag with pop dots. The final step is to add 2 lengths of ribbon through the top hole of the tag and tie with twine. I certainly hope you've enjoyed this stop on the journey. Don't forget to add your link to the current challenge, Vintage Travel & Luggage. 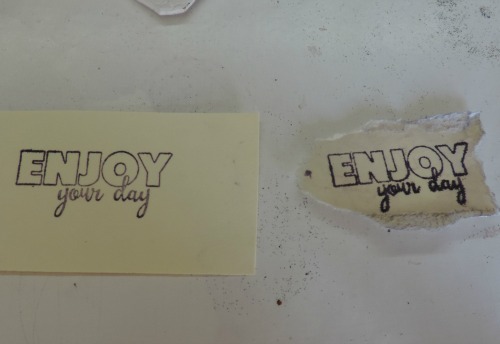 What a great textured tag, Sandy - and your detailed tutorial is great too. Love the texture on this tag and beautiful composition. Sandy this is such a lovely tag. I love the effect of acetate on top of the colored background. And I also love that you kept it rather simple ...meaning not too much embellished. Thank you for a great and detailed step-by- step.. It was such a fabulous way to inspire all of us. Sandy, what an amazing tag and fabulous and informative tutorial. I've learned and will take away several things from your bag of tricks today! Thank you so much for sharing! Hugs!